LiveDrive review from BestBackups, looking at the features, customer support, security, and value for money offered by this ambitious backup provider. Ambitious but ultimately confusing, LiveDrive attempts to do a lot of different things, but ends up as its own worst enemy, with good features spread across an over-complicated array of different plans. You can read a detailed review below or sign up now. There are three subscriptions available for LiveDrive users – Backup, Briefcase and Pro Suite. Unlike the majority of providers, which offer either an online backup service (focusing on automatic backups of all your data) or a Cloud storage plan (which prioritise file sharing and manual uploads), LiveDrive gives you the full range of options, with the choice to pick whichever service suits you best – or a combination of the two. To start with, their Backup plan offers an online backup service only, with no file sharing options but an unlimited amount of storage space. With prices beginning at around $5.40* per month, you’ll get coverage for one computer, although you can add additional devices for 1 Euro per device per month. For a Cloud storage option, you can turn to Briefcase, which offers 2TB of online space as well as a local storage option which acts as an additional hard drive for your computer. 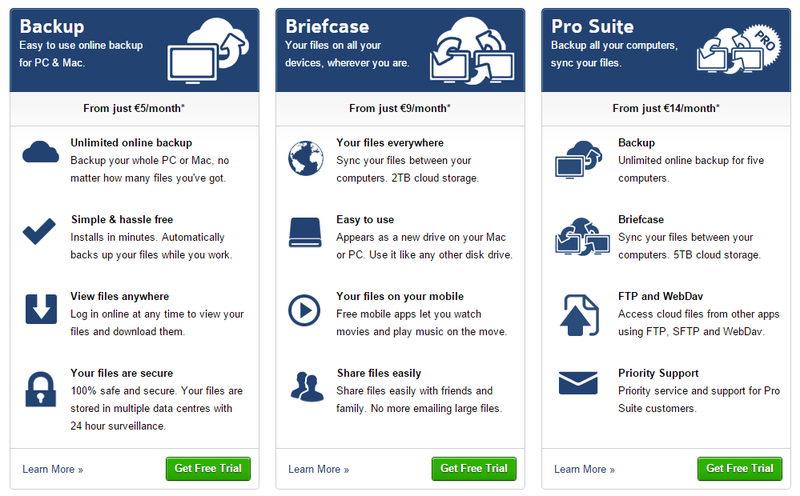 Briefcase also lets you access extra features including file sharing, and is available for a minimum of $9.80 per month. If you’d like additional Cloud storage space, you can add more for approximately $6.50 per TB. Finally, there’s Pro Suite, which combines the two. This option gives you 5TB of online storage space, as well as backup features and local storage, and can cost as little as $15.30 per month. All those ‘prices as low as’ conditions are there for a reason, as LiveDrive are very sneaky about their pricing. On their website, you’ll only see the lowest prices, which are in fact how much a two-year subscription would cost if broken down into monthly installments – even though you’d actually have to pay the full amount in a lump sum.The only way to find their ‘real’ prices is by signing up, but don’t worry if that sounds like a lot of effort – because that’s exactly what we’re here for! Backup – $6.50 per month, $65 for a year, or $105 for two years. Briefcase – $11 per month, $118 per year, or $210 for two years. Pro Suite – $17.50 per month, $183 for one year, and $340 for two years. Admittedly, the differences aren’t that big, but who wants to be given false information? Not us. If you’d like to take LiveDrive for a test run, you can sign up for their 14-day free trial. Be warned though – you’ll need to enter your bank details to make an account, so might end up with an account you don’t want if you decide not to go ahead. Payment can be made using most major credit and debit cards. * All prices are given in Euros – conversions based on exchange rate at the time of writing. UK-based online backup and Cloud storage provider LiveDrive was founded in 2000 by Andrew Michael – a tech entrepreneur also responsible for creating hosting services site Fasthosts and online services marketplace Bark. In 2014, LiveDrive was bought by j2 Global, inc. – a communications company with brands including IGN.com, PCMag.com, and KeepItSafe to its name – and now has over 1 million customers around the world, as well as maintaining partnerships with PC World, Dixons, CompUSA, and more. LiveDrive’s Backup account holders can automatically upload all of their files to the Cloud, with the option to schedule how often files are backed up, and when uploads start. Alternatively, Briefcase users can manually select which documents they want to upload, and Pro Suite account holders can do both. 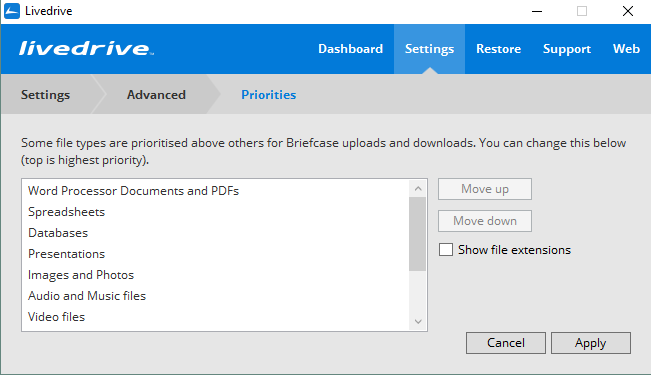 If you opt to use Briefcase, you can also use their Priorities tool to decide the order in which you want different file types to be backed up. LiveDrive allows users to backup from Windows and Mac operating systems, as well as mobile devices running iOS, Android, and Windows 8. Although LiveDrive’s Backup subscription doesn’t support file sharing or synchronisation, users of their Briefcase and Pro Suite plans can give friends and colleagues access to their files. Sharing can only be initiated from the Briefcase area of storage, but the process is nice and simple. 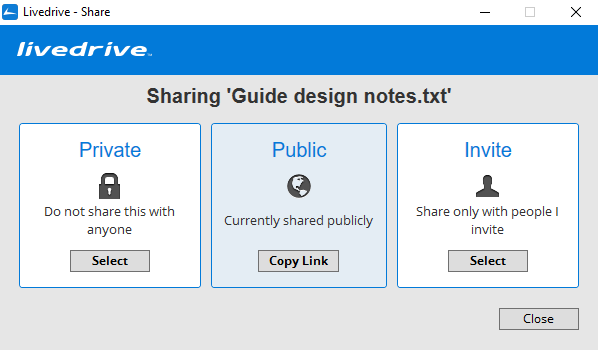 If you want to share files, you can choose between creating a public link, which can be shared anywhere, and inviting specific friends or colleagues to view individual files. Both require just a few clicks, with the latter achieved by using LiveDrive’s integrated messaging system to grant them access via email. LiveDrive retains the 30 most recent versions of users’ files, allowing you to return to previous drafts of your documents, even if you’ve since saved over them. They also hold on to deleted data for 30 days after it has been removed, in case you need to retrieve a file you thought you wouldn’t need. As well as Cloud storage, Briefcase subscribers also get access to local storage space. This comes in the form of a mirror of your C: drive, into which you can simply drag and drop your files to add them to the Cloud. As well as providing extra storage space, this also helps to speed up your backup process. If you want to access files from more than one computer on a single network, LiveDrive will make things easier for you by bypassing the Cloud entirely. Instead, they’ll transfer your data directly from one computer to another across the network, saving you the inconvenience of waiting for slow uploads and avoiding the risk of using up all of your bandwidth. This process is not encrypted, which may outweigh the positives for some, but there are still undeniable benefits to this more direct approach to file sharing. Once again, this feature is available to Briefcase and Pro Suite subscribers only. A few years ago, LiveDrive incorporated a service which allows users to stream backed up movies and music directly from their LiveDrive account. Available to access from both web browsers and mobile devices, this feature removes the need to use a third party service to play files and also gives LiveDrive the added bonus of acting as a media player. Although very basic, we found the whole streaming process to be simple and speedy, making it easy for us to watch videos almost instantaneously. Familiar navigation and a full-screen mode sealed the deal – this feature may not be fancy, but it certainly does the job. 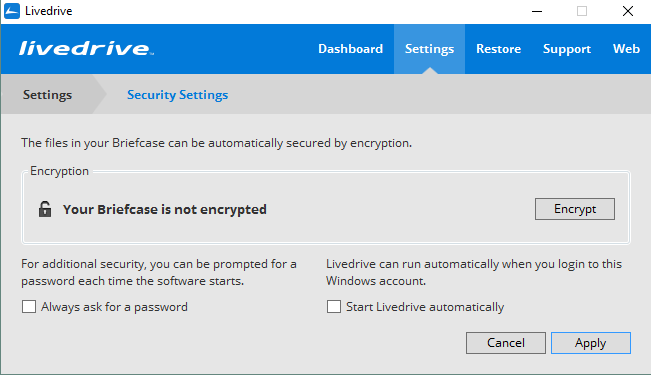 It’s hard to find details of LiveDrive’s security features on their website – the only concrete information we could discover at first was that files are encrypted with 256-bit AES. A bit of poking around also revealed that you can choose to encrypt files during transfer, and to request that your password must be entered at every sign in. Briefcase and Pro Suite users can also elect to encrypt the contents of their local storage, although this has to be manually applied by navigating to your account;s Security Settings. While this all sounds fairly good, there’s a distinct lack of information available on the encryption process itself. From the information that was available, we surmised that users cannot set their own private encryption keys – meaning that encryption isn’t end-to-end, and LiveDrive (and therefore also j2 Global) have access to the information needed to decrypt and access your files at any time. LiveDrive’s customer support comes courtesy of their ‘Support Force One’ team, who offer customer support with technicians on hand 24 hours a day, seven days a week. While this sounds very impressive, it becomes a little less so when you discover that there is no live chat or phone support on offer – just an email service, although they do promise replies within 24 hours. Support resources are limited too, with a Knowledge Base that spans a smallish range of topics, and no forums on offer either. On the plus side, the ability to check whether your performance is being affected by LiveDrive system maintenance is a handy extra, and Getting Started guides are likely to come in useful for less experienced users. LiveDrive remained true to their promise, replying to all of our support requests within 24 hours – both providing information and fixing technical issues. All communication was clear and professional so, although direct forms of contact are still missed, it seems that LiveDrive’s email-based support has been developed well enough to meet the majority of needs. LiveDrive made news in 2014 when they closed around 400 customer accounts with little warning. The deletions, which affected only customers in the UK, were reportedly performed due to accounts holders’ excessive use of bandwidth and/or storage space during the previous year; although no official definition of what was considered ‘excessive use’ was given. LiveDrive received many complaints regarding the incident, with most berating the lack of prior warning and insufficient customer support for those affected. Although this did impact upon the company’s reputation at the time, LiveDrive has since bounced back, with public support for the brand recovering and no further problems making the headlines since then. LiveDrive maintains profiles across all major social networks, including Twitter and Facebook. Both of these accounts feature one or two posts every month, mostly consisting of company updates and a few replies to customer support requests, although these tend to be fairly limited. They also have a blog, which follows a similar format, although posts tend to be longer and more detailed. We encountered a couple of problems with logging in when we first signed up to LiveDrive, with error messages repeatedly stopping us from accessing our account. Unfortunately, there’s no way to contact Support Force One unless you’re signed in so, with low expectations, we sent an email to the Sales department instead. To our pleasant surprise, we received a response around 10 hours later, informing us that the issue had been resolved, and were able to sign into our account without difficulty. While this may have been a much more general problem that was resolved for other reasons, we still appreciated the notification, as well as the fairly prompt response. LiveDrive is easy to use for basic tasks, with a nice enough website and a simple (if distinctly unstylish) desktop interface. However, when using their Pro Suite, the combination of Backup and Briefcase features can become confusing as, rather than integrating features from both plans into one cohesive subscription, they appear to have simply given users access to everything. This means that there are two locations to transfer files to and from (only one of which allows you to share them afterwards), two sets of settings, and two places from which to access and retrieve your files. Fortunately, it’s not quite as complicated as it sounds, as all of the processes are, by themselves, quite straightforward. On the other hand, it can be very frustrating if you’re trying to locate a particular feature. In addition to this, uploads are very slow, with even text files taking a long time to upload using a 20Mbps broadband connection. LiveDrive’s mobile app lets you perform all of the major functions associated with your account. For Briefcase and Pro Suite users, this means accessing all files saved to the Cloud and in your Briefcase, as well as file sharing, automatic uploads and the option to stream saved music files. Well-designed and easy to use, it compliments computer-based accounts well. Plenty of backup companies have tried to combine the unlimited storage of online backups and the convenience and accessibility of Cloud storage into a single account, but LiveDrive has gone the extra mile by offering both options separately as well. While we really appreciate this attempt to provide more flexibility, it’s been somewhat clumsily done, leaving the Pro Suite (their most promising subscription) something of a confusing mess. If you’re looking for a very basic online backup, there’s something to be said for their Backup plan, although don’t expect much beyond uploading and downloading files, and if you like the idea of local storage bundled in with Cloud-based file sharing, Briefcase might be of interest. However, by trying to do so much, LiveDrive fails to do a really exceptional job of anything. That’s not to say it’s bad – if you don’t mind untangling all of the threads, there are some good features in there – but ultimately there are easier (and more secure) ways to keep your files safe. What do you think of LiveDrive? Leave your thoughts in a comment.